Durban – The first of four events in the 2013 Billabong Junior Series presented by BOS kicks off this weekend (2 & 3 March) at New Pier in Durban. Featuring nearly 100 of the country’s top 20-and-under surfers, the series offers a total of over R750 000 in prize-money and prizes along with coveted titles in eight age divisions for boys and girls. Favourable conditions with light winds, a pushing swell and excellent sand banks at Durban’s premier surfspot all point to an exciting start to the 17th annual edition of South Africa’s longest running junior surfing series. The event gets underway with an opening function for all competitors and officials in the Collopy Room at Durban Surf Lifesaving Club at North Beach at 6pm on Friday evening where snacks will be served. The first heats in the Under 16 boys’ division take to the surf at 8am on Saturday morning. The early rounds for the U12, U14 boys and girls, U16 boys and U18 boys and girls will be run on Saturday with all the finals scheduled for Sunday. The U20 divisions, where the 16 boys and eight girls are competing for winner-takes-all R10 000 prize-purses, will be run entirely on Sunday. Other awards at stake at the event include the VonZipper Flair Up Award and the DaKine Youthful Movement Award which each earn R10 000 for the winners, the Nixon Winner Takes All (WTA) contest where the surfer posting the highest heat score receives a WTA engraved Nixon watch and specialty prizes including an array of cutting-edge Sony products. Awards for the overall top performers across the four-event series include Billabong sponsorships amounting to R75 000 each for six deserving surfers, the BOS Surfer of Series who collects cash and prizes to the value of R20 000 and the All Aboard Travel Sportsmanship Award for the surfer displaying the best sportsmanship who wins a return ticket and four nights accommodation in Bali, Indonesia, valued at R17k. BOS Ice Tea continues to ride the perfect wave, cementing their connection to surfing as a sport and lifestyle by becoming the presenting sponsor of the Billabong Junior Series. Since their launch in 2010, BOS Ice Tea has been involved in surfing through their sponsorship of big-wave legend Grant ‘Twiggy’ Baker, the Wavescape Film Festival and the annual BOS Earthwave Beach Festival. The sponsorship of the Billabong Junior Surf Series builds on that foundation. BOS is well known for their their weird and wonderful sampling stunts, numerous design awards and for doing their bit for the environment by planting 1 tree for every 2000 cans sold. The proudly South African company is excited to be aligned with the country’s longest running junior surfing series and its natural, healthy and family friendly ethos. Now in its 17th edition, the Billabong Junior Series has created the platform for the likes of Jordy Smith, Travis Logie and Bianca Buitendag to hone their competitive skills before going on to become international stars. At the same time the series provides the opportunity for 20-and-under surfers to experience new surf spots, meet and mingle with their heroes and get to know their peers countrywide. The 2013 season kicks off at New Pier in Durban this weekend, 2 & 3 March, and continues in East London in April and Cape Town in August before concluding at Seal Point in the Eastern Cape in September where the overall series champions in Under 20, U18, U16, U14 and U12 boys and U20, U18 and U14 girls divisions will be crowned. BOS will add further value to the series by also sponsoring the BOS Surfer of the Series award which will go to the surfer who has performed the most consistently across the whole series. It will be open for entries from all divisions and the winner will walk away with a 20K overall prize consisting of R10K cash, a custom made BOS surf board, special BOS merchandise and a year’s supply of BOS Ice Tea. • The BOS packaging is bold, colourful, and graphic exuding a youthful, and open spirit. Buitendag posted a comfortable victory in her Round of 24 heat before finishing second behind Alessa Quizon (HAW) and eliminated ASP World Junior Champion Nikki van Dyk (AUS) in the Round of 12 to set up a quarter-final encounter against Lakey Peterson (USA), who was the day’s standout performer. The South African’s confidence-boosting performances at Newcastle are an excellent warm-up for her debut on the ASP Women’s World Championship Tour (WCT) which gets underway on the Gold Coast on 2 March. There she will be up against the world’s top 17 ranked women in the race for the 2013 world title. Stephanie Gilmour (AUS), the five-time and reigning ASP Women’s World Champion, was a surprise elimination today when she placed fourth in her Round 24 clash. South Africans Sarah Baum (25th) and Rosanne Hodge (37th) were ousted in yesterday’s action while Faye Zoetmulder (49th) was sidelined on the opening day of competition. Sawyer and de Vries finished equal 75th when they placed fourth in their respective Round of 96 heats earlier today, collecting 160 ratings points and US $500 (about R4 250) each. Van Zyl ended equal 97th when he came in 3rd in his Round of 144 heat on Monday. Shaun Joubert (Mossel Bay) and Mikey February (Kommetjie), the two remaining Saffas in the event, will contest their Round of 96 heats when competition resumes. Joel Parkinson (AUS) made a successful return to competition surfing after winning his maiden ASP World Title in Hawaii in December when he charged to victory in his Round of 96 heat. Only nine heats of men’s surfing were completed today with 2012 event runner-up Filipe Toledo (BRA) one of the standouts with his high-flying aerial repertoire. Sarah Baum started her 2013 pro surfing season with a meritorious fifth place finish after reaching the quarter-finals of the ASP Star rated Breaka Burleigh Pro Women’s held in excellent 1.0 to 1.5 metre waves at Burleigh Heads in Australia earlier today (Saturday). The inform 19 year-old from Athlone Park, Durban, who ended 2012 ranked No. 17 on the ASP Women’s Star Series, progressed through three rounds of four and three-person heats before elimination by current ASP No. 6 Malia Manuel (HAW) in a one-on-one encounter in the quarters. Baum collected US $1 100 (approx. R10 000) and a valuable 1 560 points from the event which was won by ASP No.2 and event top seed, Sally Fitzgibbons (AUS), who narrowly defeated Courtney Conlogue (USA), the ASP No. 5, in the final. South Africa’s Rosanne Hodge (East London), who spent four seasons (2007-2010) competing on the ASP Women’s World Championship Tour (WCT), the highest level of women’s surfing, finished equal 9th at Burleigh. Bianca Buitendag (George), who starts her rookie year on the Women’s WCT on the Gold Coast in March, placed equal 19th and Faye Zoetmulder (Port Elizabeth) ended equal 55th in her first ASP event after a serious injury that sidelined her for the second half of last year. The 4-Star ASP rated men’s Breaka Burleigh Pro has been reduced to the last eight with former two-time ASP World Champion, Gold Coast local and current ASP No. 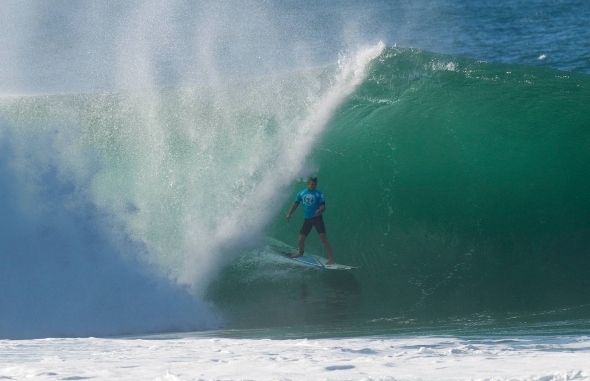 3, Mick Fanning, a surprise elimination after being ousted by fellow Australian Mitch Crews and Marco Fernandez (BRA). The men’s champion will be crowned on Sunday and all the action can be followed live at http://breakaburleighsurfpro.com.au starting around midnight (SA time) tonight. David van Zyl (Glenashley) and Steven Sawyer (Jeffreys Bay), the only two SA surfer’s in the men’s draw, finished 49th and 65th respectively. Three South Africans will be in action with Benji Brand (Kommetjie) starting his campaign in the Round of 128, his brother Davey in the Round of 96 and ninth seeded Shaun Joubert, formerly from Mossel Bay but now living in California, starting in the Round of 64.